Review date: 7 October 2000. Barely frickin' there at all. The AOpen CRS-446U CD rewriter is 130mm deep, 152mm wide, and a barely-perceptible 16mm thick (5.1 by 6 by 0.6 inches), and it only weighs 230 grams (half a pound). In the ceaseless quest to make high-tech gear that's actually smaller than something that has to be put inside it, this thing is well on the way to Nirvana. At a glance, you'd think it was a minimalist portable CD player, but it's not. It's a proper CDR and CD-RW unit, that does 4X writing, 4X rewriting, and reads CDs at 6X. The reason for the less-than-amazing read speed is that this gadget connects to a computer using the USB interface, which can only move 12 megabits per second. USB data storage devices can't shift more than about 900 kilobytes per second of data, and 900 kilobytes per second is 6X speed. The original CD-ROM drives operated at the same speed as audio CD players, and moved 150 kilobytes per second. IDE and SCSI CD writers that can burn at 8X, 10X, even 12X, are now available, and they can also serve as speedy readers. But 4X speed will give you a CD in about 20 minutes, which is quite acceptable for a super-portable device like this. The 446U's magnesium-look case is only plastic, but the drive feels solid nonetheless. The lid's no less cheesy than those on mid-priced portable CD players, but it closes securely, and there's no flex in the chassis of the drive. The lid-latch button's on the front of the top. When the drive doesn't want you to open it, the latch button locks. If something goes Awfully Wrong during a CD write and your computer hangs, the drive'll stay locked until you turn it off and on again. There's a power switch next to the DC barrel socket at the back. The USB connector's on the back of the right side. And there's a volume control on the front, and a 1/8th inch stereo headphone socket to match on the front of the right side. There's no hardware CD play button, though; you need to run CD player software on your computer to play an audio CD. There are four small but super-sticky rubber feet on the bottom of the drive, which is important. CD writers don't like being bumped while they're doing their thing. And portable devices that slide all over the place are annoying even if you don't lose data because of it. The CD burning software that comes with the 446U is the usual, and perfectly acceptable, Adaptec Easy CD Creator v4.02 and DirectCD v3.01. Easy CD Creator is the general purpose disc creation and copying package; DirectCD is packet writing software, that lets CDs look like ordinary random access media that you can write small files to without wasting vast amounts of space. You also get an update diskette that means you don't have to download anything to upgrade to the latest versions of both packages. There's also Norton Ghost v5.1D, an excellent drive image save and restore package. V5.1D was the last version of Ghost to come out before the current edition, "Ghost 2001", but it's still highly worthwhile. Ghost's core function is the saving of a whole drive's contents as one file - which you can then burn to CD, if you like. You can restore that file to the drive if something goes wrong, or "clone" the drive onto a new drive or a whole new computer. Ghost handles partitioning and formatting on the fly, so you can take a new drive straight out of the anti-static bag, plug it in and slap a copy of your old system on it in minutes. V5.1D's not quite as zooty as Ghost 2001, which adds Linux EXT2 file system support, Windows 2000 and ME compatibility, updateable images, improved PC-to-PC cloning and, significantly, direct imaging support for CD writers. 5.1D can't write directly to the CD burner - you write the file to hard disk, then burn it to CD-R or CD-RW like any other file. But, as pack-in software, Ghost 5.1D is very good indeed. At the other end of the spectrum, you also get Gamut2000, a less than marvellous package I last encountered when I checked out the deluxe version of the PC Chips Book PC (review here. The back of the Gamut CD cover proudly announces that "GAMUT comes from the abbreviation of God AMUsing Tools", and goes on to say that "GAMUT family intends to provide the amusing tools for various audio and video applications". Well, I've no idea what any particular god thinks about this software, but WE are not amused. Gamut is an audio ripping, MP3 encoding and MP3 playing package. It's a lousy encoder, though. There are many better programs you can download for free. USB storage devices might not be mercurially fast, but they're sure easy to install. Plug in power, plug in USB, turn on burner. The computer detects the new hardware and asks for a driver; you feed it the included floppy, which has drivers for Windows 98 and 2000, and you're in business. USB is a powered interface, but it can't deliver enough juice to run a CD writer. So the 446U has its own mains adapter. The plugpack that comes in the box is a universal voltage unit with a US plug on it. This Australian version of the package also gives you an Aussie pin converter so you can plug the adapter, somewhat inelegantly, into a power point here. Installing the software's no harder than plugging the drive in. You don't have to use Easy CD Creator if you don't want to; there's nothing special about the USB burner that stops it from working with other packages like Ahead Software's excellent Nero. If you don't want to plug your headphones or speakers straight into the 446U, you can still play audio CDs, by pumping the digital CD data down the USB cable. Windows 98SE and later, including Windows 2000, let you turn on digital audio for CD-ROM drives that support it; they read the raw data and send it to the computer, to be digital-to-analogue converted by your sound hardware. Any CD-ROM drive that can "rip" audio CDs to digital sound files should be able to do this, and the 446U can do it just fine. AOpen's Web page for the 446U, here, describes its pop-open design as "Crab-Shell Type". This is news to the world's crabs, who could have sworn their shells didn't have a hinge anywhere. Fortunately, the 446U neither nipped me nor scuttled off sideways when I pressed the open button, and the manual at least says "clam-shell". Like all clamshell CD devices, the 446U exposes its lens to the world. A dusty lens on an audio CD player can cause skips and noise, but it doesn't happen often - you need a lot of crud for it to be a problem. CD writers are much touchier about scunge, and commonly give mystifying errors that suggest some major hardware problem when all they really need is a quick clean. If you know about the problem, though, it's much less of a one. A quick whisk with a gentle little lens cleaning brush and the writer'll be working perfectly again. The clamshell design may let dust in more easily, but it makes it much easier to remove it, too. There's no fishing around with a long cotton swab, as you have to do in order to clean a normal CD writer without taking it to bits. I checked the CRS-446U out with some Datastream CD-Rs provided by Aus PC Market (click here to place an order, if you're in Australia!). They're 80 minute discs with a shade over 700 megabyte data capacity, versus the 74 minute, 650Mb capacity of standard blanks. 80 minute discs used to be expensive oddities, of interest primarily to music CD compilers, and software pirates trying to copy oversized game discs. 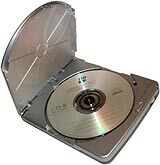 The high capacity discs had compatibility problems with some burners, some CD-ROM drives, and many CD writing packages. They're thoroughly mainstream, now; pretty much everything can read them, and pretty much everything can write them, too. 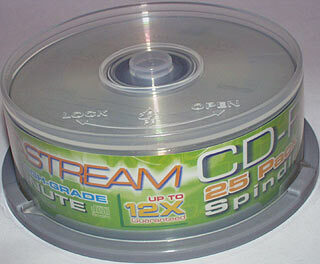 A spindle of 25 of the Datastream blanks is yours, delivered in Australia, for $AU33. OK, so you don't get any jewel cases, but $AU1.32 each, delivered, still takes some beating. While it's running, the little burner makes about as much noise as any portable CD player. And, if nothing stops it from getting data as fast as it needs it for the write speed you've selected, the 446U works as well as any other CD burner. There's nothing to it. But if you've got a flaky storage interface in your computer, the way to find out all about it is by connecting a CD writer. If your IDE or SCSI or USB or, may the gods beneath the sands preserve us, parallel port, interface isn't able to deliver the data stream the writer needs, you're in trouble. Just being able to average the right transfer rate is only acceptable if there isn't so much variation that the data buffer empties. The 446U has a one megabyte write buffer, so a single 1.7 second data interruption, or a sequence of smaller ones close enough together that USB can't catch up, will mean you'll soon have one more neat-o polycarbonate disc to put under your drinks. Anybody who does a lot of CD writing, though, knows that if you're going to keep on using the computer while you write and don't want a good chance of wasting a disc, you should pick a low write speed. At 1X or 2X the 446U should have no trouble burning a disc while other USB stuff is going on. At 4X, you should go for a brief healthy walk and leave the computer in peace to finish the job. The 446U at 4X speed wrote 683 megabytes in 21 minutes, go to whoa, as you'd expect. A 4X writer can write a whole 650Mb CD worth of data in only 15 minutes, but the lead-in and finalisation write time is an overhead that doesn't change much with increasing writer speed. With 12X writers now available (for faster interfaces than USB), this overhead time will probably soon be longer than the main write time! At $AU726, this certainly isn't the cheapest CD writer on the market. You can get faster internal IDE drives for less than half the price. AOpen's own CRW-9832, for instance, which does 8X writing, 4X rewriting and 32X reading, is $AU319. But the 446U is a quite different product. You can set it up anywhere, quickly, and you can use it with any USB-equipped PC, including laptops. If you need to burn CDs on the road, this is the product you want. You can't run it from a battery pack - well, not unless you've got a nice five volt regulated one - but anywhere there's a power point, you can make CDs. The 446U's actually not all that expensive, by external writer standards. Sony's Spressa USB Plus (see here) has similar specs to the 446U, but it's just a big fat 5.25 inch internal drive in an external case, comes with an unexciting software bundle, and sells for $US270 or so, which translates to not much less than the AOpen's price, once you get one here. 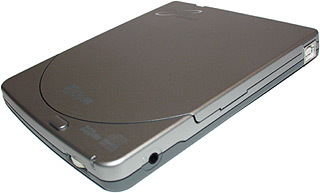 You can get an Iomega Zip CD external USB drive for $AU500 or so, again with the same specs as the AOpen; it's more svelte than the Sony, but it still looks like a housebrick next to the AOpen drive. If you're a bargain hunter, you can get an old-model IDE CD burner (no point getting a new 12X-write drive if you're not going to be able to use that speed), stick it in a USB-to-IDE external case, yours for less than $AU190, and get away for less than the price of any brand name external drive. It'll work the same - all of these things, including the AOpen, are actually USB-to-IDE jobbies, anyway. But if you want something small and pretty and easy to tote around in a laptop bag, the CRS-446U is absolutely where it's at. Recommended. 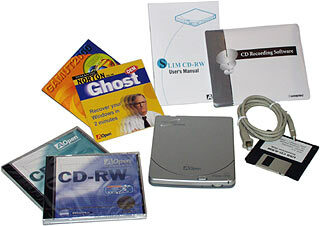 CD-RW was originally called CD-Erasable, but they changed the name, partly to assuage the concerns of users who didn't like the idea of all of their data being erased if they so much as coughed, and partly because "CD-Rewritable" makes the system sound like a normal read/write device, which lets you delete and rename and move files. Well, you can do all of these things on a CD-RW disc, if you're running packet writing software like DirectCD. But you can do the same stuff with a CD-R disc. This is because the packet writing software just lets you change the file allocation information on the disc, so data can be flagged as having been deleted or renamed or put in another directory, or whatever. When something's burned on a CD-R, though, it's burned for good. You can't ever erase it and get the space back. So when you "delete" a file with packet writing software on a CD-R, you've just changed the directory information to no longer report that file's existence. The data's still there. CD-RW works exactly the same way, except it's possible to erase the entire contents of the disc any time you like and return it to its unwritten state. You can't blank just part of the disc; you have to zap the whole lot. So, essentially, a CD-RW disc just acts like a sequence of CD-Rs, not like a true read/write/delete device.